These quotes appeared almost ten years ago, yet they echo those of a similar debate occurring among American design and corporate circles in the 1920’s and 1930’s. In 1928, Art Deco designer Paul T. Frankl remarked that “Simple lines … tend to cover up the complexities of the machine age. If they do not do this, they at least divert our attention and allow us to feel ourselves master of the machine.” Frankl here was writing about the rising demand for beauty in products, a demand that appeared sometime around the 1920’s when consumers became more interested covering the above-mentioned guts with a pretty shell and demanded more “attractive” products as opposed to “haphazard, disorderly” goods that evoked a “engineered as you go” look. This emphasis on attractiveness would reach its clearest and most effortless expression only four years later in the pages of Norman Bel Geddes’ industrial design manifesto Horizons (1932). With sumptuous images of cars, airplanes, trains, houses and furniture — all designed by Bel Geddes — the former stage designer now turned design expert applied the visual vocabulary of aerodynamic and hydrodynamic design to a host of industrial and consumer objects. Along with the work of other early twentieth century industrial designers like Raymond Loewy, Walter Dorwin Teague or Henry Dreyfuss, Bel Geddes’ projects are often heralded as examples par excellence of streamlined design. With graceful curves and ovoid shapes evoking speed and efficiency, streamlining was more “an aesthetic device rather than an aerodynamic one.” Yet the difference was often not so clear. Streamlined designs only mimicked fundamental ideas about countering air resistance, instead capitalizing on the visual appeal of smooth, clean forms and surfaces to sell more units. This was not lost on critics. 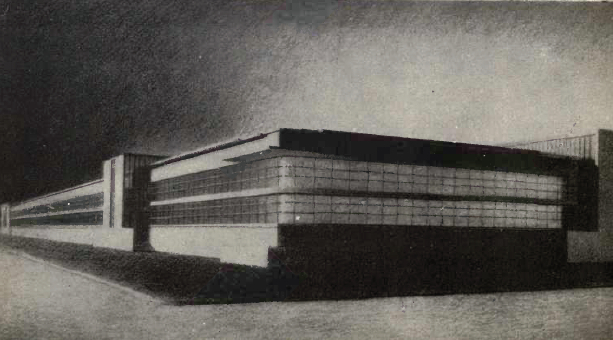 In 1933, Douglas Haskell, one of the first American critics of modern architecture, wrote a scathing review of Horizons, noting that Bel Geddes’ wrote not much more than a “lucid story … in which the technical details have been either flattened out or spirited away to form no obstacle to the technical reader.” Yet as other have indicated before, he was an advocate of a scientific approach to streamlining. Thus for “Streamlining,” an article penned for the November 1934 issue of Atlantic Monthly, Bel Geddes namechecked theoretical aerodynamicists like Ludwig Prandtl with apparent ease for the purpose of educating the general public about the scientific principles that supposedly informed streamlined design of radios and toasters. This insistence on articulating a scientific basis appeared even earlier in Horizons when he mentioned efforts of aircraft designers like Glenn Curtiss in applying principles of aerodynamic design to automobiles. Yet such arguments were marshaled in service of an argument about aesthetics. And in some instances, critics were nevertheless quick to point out that in those moments where science was being invoked, Bel Geddes’ research on aerodynamics was still fraught with error. Despite all of these faults, his efforts in promoting aerodynamic principles nevertheless calls to mind the observation that good design involves issues of “technology, cognitive science, human need, and beauty.” Furthermore, describing streamlining as a direct application of scientific thought to the creation of beautiful industrial objects underlines how advertising and aerodynamics were far from strange bedfellows. In fact, it was Bel Geddes’ interest in streamlining as a discipline that unified these two realms. Aeronautical engineering developed out of naval engineering as its own separate discipline around the First World War. It was born not only of developments in practical and theoretical aerodynamics, but also from rapid changes in aircraft technology. It finds a contemporary equivalent in psychology, a discipline that was trying to unshackle itself from field of philosophy. In both instances, issues of application were at stake. Both would find their respective homes in laboratories. The challenge for aeronautical engineers rested in applying their knowledge to the evaluation and testing of military and commercial aircraft designs using scale models in wind tunnels. Psychologists faced an analogous situation: they had to create conditions and experiments in which to apply their studies and conclusions about human subjects to real world situations.The latter, of course, is one way to describe the rise of what would be called behaviorist psychology. The term came to be used in professional circles in 1913, when John B. Watson defined behaviorism as an “experimental branch of natural science” whose “theoretical goal is the prediction and control of behavior.” This regimen of prediction and control relied on an experimental regime that sought to induce certain actions and reactions in subjects in laboratory conditions through behavioral modification. In 1920, Watson left academia to join the J. Walter Thompson advertising agency in New York. With offices in Boston, Chicago, and London, J. Walter Thompson was at the time the largest and most successful agency of its type. This was due partly to the role played by Stanley B. Resor , J. Walter Thompson's visionary president who imbued his agency’s culture with a corporate ethos that accommodated Watson’s behaviorist thinking easily. 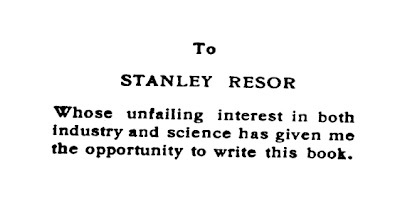 Resor was also an early advocate of advertising as a scientific discipline — something that no doubt appealed to Watson, himself seeking a forum in which to apply his ideas. Starting as an ethnographer and salesman, Watson eventually became a Vice President at J. Walter Thompson by 1924. In 1925, he also dedicated an edition of Behaviorism, the book in which he would outline all his theories, to Resor, whose “unfailing interest in both industry and science” inspired Watson. He would wield a powerful influence over Resor, who would continue to use his studies to not only rationalize advertising, but to understand consumer behavior (a development that led to the pioneering use of medical data as part of consumer research). And as head of research, he oversaw several important accounts such as Ponds, whose advertisements pioneered the use of customer testimonials in print and radio formats. In 1936, around the time that Watson left J. Walter Thompson for another agency, Resor contacted Bel Geddes to gauge his interest in being a design consultant for an upcoming ad campaign. The two men were already familiar: in 1929 Resor had given Bel Geddes his first architectural projects. One was for Thompson client Toledo Scale Company: a factory whose curvilinear façades mimicked Erich Mendelsohn’s department stores (Mendelsohn met Bel Geddes during his 1924 trip to the United States), and whose banded glazing contains an echo of Walter Gropius’ and Adolf Meyer’s factory and office for the 1914 Werkbund Exhibition. Another was perhaps the signature J. Walter Thompson project: the redesign of the conference room and auditorium for the agency’s New York office. Tall floor-to-ceiling windows with alternating curtains gave this space a dramatic verticality, one which no doubt recalled the tall central court of Frank Lloyd Wright’s Larkin Administration Building. 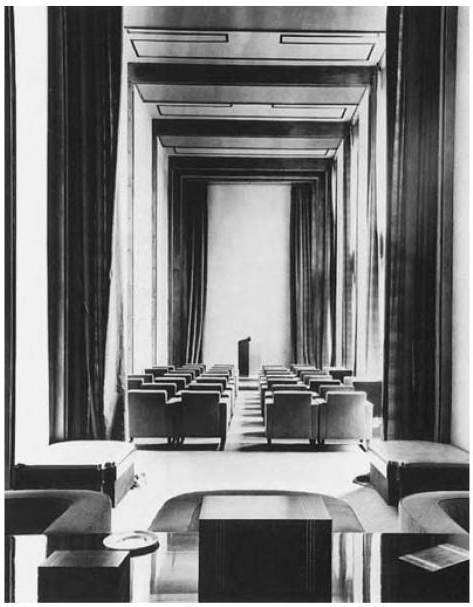 Though the conference room was much more of a renovation and opportunity to install newly-designed pieces of furniture, and though the Toledo factory was part of a study that never came to fruition, Resor would require Bel Geddes for a kind of architectural expertise that would merge with the J. Walter Thompson philosophy. It was under such a climate that Resor finally contracted with Bel Geddes to partake in a study of traffic and automobile use for Shell Oil. The contract originally stipulated for Bel Geddes to provide sketches of projects designed to portray and alleviate “the-Traffic-Conditions-of-the-Future.” And as detailed by historian Jeffrey L. Meikle in his study of this project, Bel Geddes far superseded the expectations and created a entire city and interstate highway system in miniature, complete with multi-level, complex, automated interchanges accommodating both car and pedestrian traffic, Beaux-Arts-inspired open spaces, as well as a distribution of large skyscrapers suggesting Le Corbusier’s Plan Voisin of 1925 (a project which, as it should be pointed out, was sponsored by an automobile manufacturer). 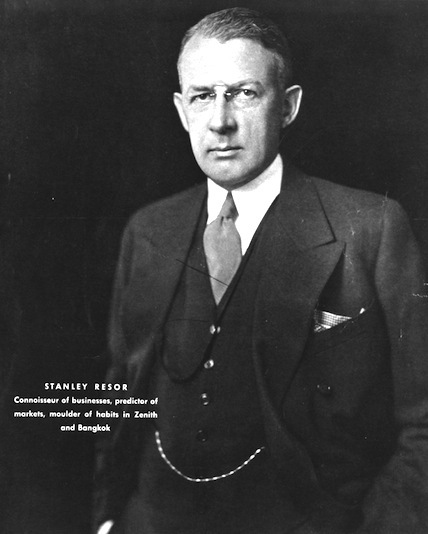 He assembled a research and development team that included Worthen Paxton, a Yale-trained architect who was a fixture in Bel Geddes’ office, an artist who went by the name of “Berdanier” (possibly the American illustrator Paul Frederick Berdanier), Brooks Stevens, an industrial designer who later became famous for his car designs as well as the phrase “planned obsolescence,” and Thompson executive William Day. The resulting model, triangular in plan and built to a scale of 1 inch equalling 100 feet, featured 11,000 teardrop-shaped vehicles and 90,000 metal pins representing pedestrians. Bel Geddes and his design team organized the model into “280 standard city blocks, drawn to scale to measure 250 by 500 feet.” Eighty-five of these blocks were covered by low-slung, horizontally-oriented buildings. The rest contained tall, 1,500-scale foot tall wooden “skyscrapers,” many with curving façades and bristling aerials. It terms of its overall scope and direction, Bel Geddes’ project evoked and perhaps rivaled other visionary projects, such as Eugène Hénard’s studies of Paris made in 1904 and 1905, Tony Garnier’s Une Cité Industrielle (1917-18), Le Corbusier’s urban plans from Urbanisme (1925) and Precisions (1930), and Frank Lloyd Wright’s Broadacre City (which had already been discussed in a 1935 issue of Architectural Record). It bears mentioning that though Bel Geddes was by no means an urban or regional planning expert, he had previously articulated his thoughts about urban design in Horizons. Specifically, he considered the skyscraper as a basic unit of urban design, noting how “If the Empire State Building, instead of covering merely a quarter of a block, covered the whole block, and went as much higher as necessary, it would accommodate all the people now working within the surrounding half dozen blocks and accommodate them more comfortably than they are accommodated at the present moment … Such a building would the population of a fair-sized city and contain every element that a city would need to function, — its own fire department, hospital and police department.” Like Le Corbusier, he believed that this approach would create more open green space. It was also a design principle that could apply to small and rural municipalities as well. And yet for all his passion for the subject, Bel Geddes only discussed matters of mobility as they applied to pedestrian circulation inside and outside these large buildings. The project for Shell Oil and J. Walter Thompson was something altogether different. Far more than a template for urbanism in the future, Bel Geddes’ model, which he labeled “The City of Tomorrow,” would be an object used to instruct audiences in the importance of transportation planning as it related to the design of cities. 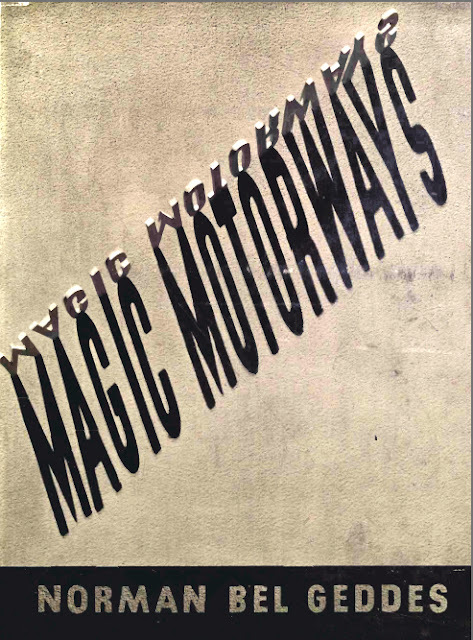 It promoted the building of better highways while advocating for the increased use of personal automobiles in the years to come. The idea that the model was to serve a didactic purpose while convincing consumers to buy more Shell gasoline was a tried and true J. Walter Thompson tactic. 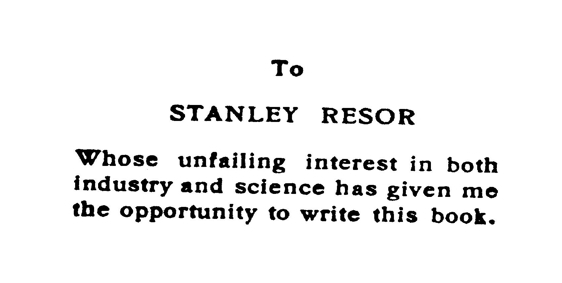 Yet the project would also suit Resor’s interest in making advertising more scientific through the use of experts. 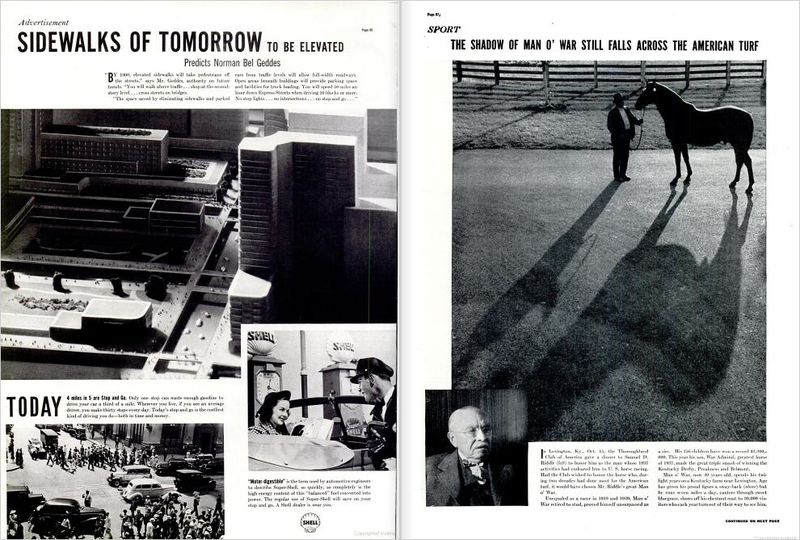 “The City of Tomorrow” thus fit the J. Walter Thompson agency ethos by capitalizing on the public’s perception of Bel Geddes as an expert and “scientific” designer. Yet another dimension of expertise would be applied to the project. Before the actual model for “The City of Tomorrow” began to be built, Bel Geddes had already began to include traffic expert Miller McClintock in its design. As the “No.1 Man in U.S. Traffic Control,” McClintock was ideal for the Shell Oil project. In 1925, McClintock wrote Street Traffic Control, a book which gained him a position in the newly-formed Albert Russel Erskine Bureau for Street Traffic Research at Harvard (started by a gift of the Studebaker Motor Company). Street Traffic Control was a comprehensive and comparative study of traffic regulations in the United States. It also surveyed and evaluated existing design recommendations such as curb-cuts, traffic islands, and signal towers in order to promote what he saw as the primary goals of traffic control. 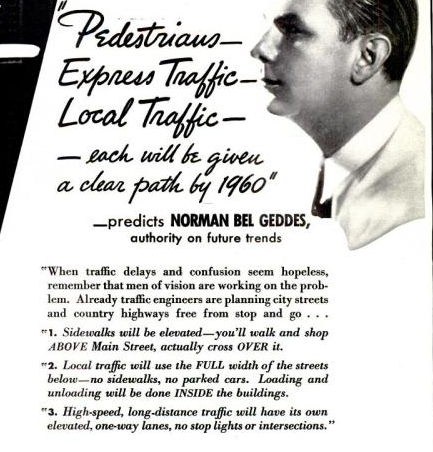 As McClintock would put it, “Free and rapid of persons and commodities over the city streets is essential for the prosperity of the community, but this necessity must always be counterbalanced by the even greater necessity to protect the lives of those who use the streets.” And like Bel Geddes, McClintock also took opportunities to spread his views via articles in popular magazines. In 1936 and 1937, an article for Fortune as well as interviews in Scribner’s and Time had made him somewhat of a household name. These pieces introduced another line of McClintock’s theories, one that would invoke Bel Geddes and Resor in an unexpected way. McClintock depicted issues of traffic congestion using the language of hydrodynamics and aerodynamics. As stated in Time magazine: “The remedy is Dr. McClintock's ‘limited way,’ a road following hydraulic principles by ‘delivering traffic as in a sealed conduit past all conflicting eddies.’ It has four elements: 1) A dividing strip down the road's centre ; 2) over and underpasses with cloverleaf detours at every intersection; 3) denial to abutting property of direct access to the highway; 4) acceleration and deceleration lanes for fast and slow traffic. All four forms of friction are largely cured by these four elements. But few roads exemplify them all.” This reliance on a scientific metaphor has not been lost on historians, some of who do not shy away from using the language of streamlining. Thus when referring to “The City of Tomorrow” model, business and advertising historian Roland Marchand observes that “A system of widely spaced, immense skyscrapers would allow for more health-promoting open space within the cities and the speed and efficiency of the highways into the city would allow more people to live in peripheral towns and suburbs, affording workers a more wholesome suburban life.” Meikle observes how McClintock “wanted to streamline the flow of traffic, just as industrial designers hoped that their modernistic products would streamline the flow of goods from producers to consumers by overcoming sales resistance.” This last statement is provocative as it alludes to how “The City of Tomorrow” dovetails with Bel Geddes’ and Resor’s interests. Meikle’s observation frames the behaviorist desire to modify and control behavior in aerodynamic terms: behavioral efficiency now becomes “overcoming sales resistance.” With these in mind, it is now possible to understand how “The City of Tomorrow” would leverage architecture as part of a distinct and compelling vision of urban living. This is because like airplanes, trains, cars, or refrigerators, architecture could be branded as an example of good, beautiful design. And this meant that a beautiful building (or city) was the very thing that could inspire a consumer not only to buy more products, but to also buy into a vision of the future. All would come to fruition in a series of full-page advertisements for Shell taken out in Life and Saturday Evening Post in 1937. Photographed by Bel Geddes’ associate Richard Garrison, “The City of Tomorrow” appears as a pristine metropolis only slightly occluded by wisps of fog and yet draped in dramatic shadows. Some photographs utilize shallow focus to give a sense of the extraordinary scale and space being depicted. In others, the model appears as if photographed on a sound stage. Yet all of the advertisements follow a similar structure. 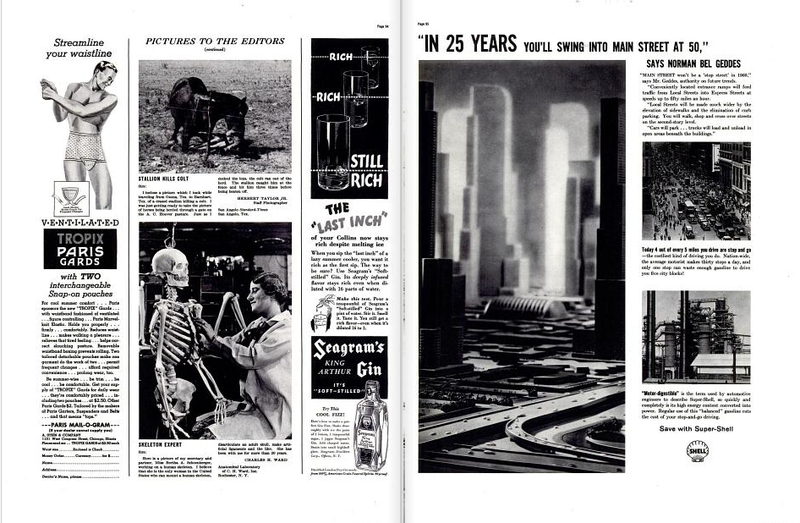 They begin with a quote from Bel Geddes, touted in the ads as an “expert in future trends.” From that point on, explanatory texts describe Garrison’s photographs, many which focus on the relation between the city and the highway (or architecture and automobile). Everything about these images indeed suggest that the relationship between these two is unequal. 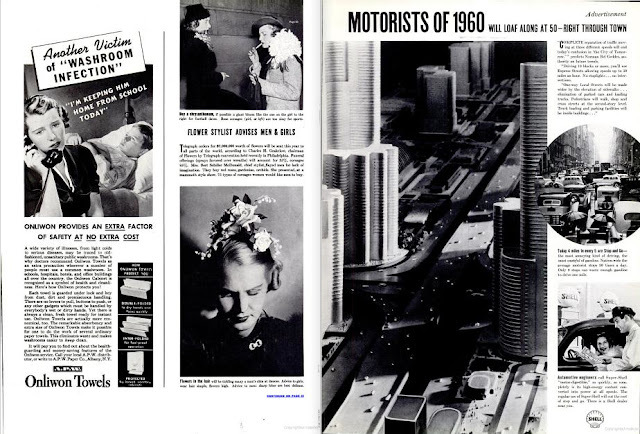 More importantly, they envision the year 1960 as much more than an era of mobile urbanism, but one where highway planning becomes the primary engine for urban design. “Today 4 miles in 5 are stop and go — the most annoying, the most costly type of driving there is.” With these concluding words, each of the Shell ads created a dissonance of sorts and leveraged the very thing identified as causing problems — traffic jams — into a justification for buying more gasoline. Copy and image combined to depict an urbanism that was dysfunctional not because of the way architects and planners designed and laid cities, but rather because of impediments to traffic. Furthermore, these impediments were portrayed as costly. 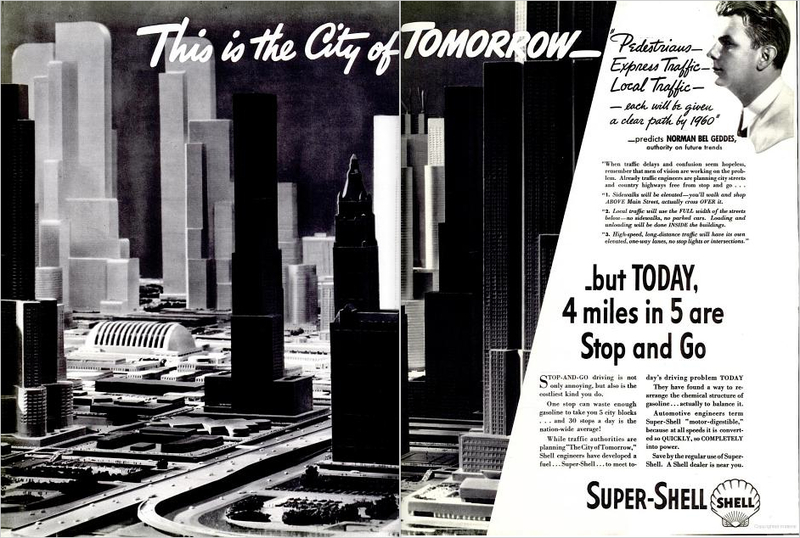 If consumers could not live in “The City of Tomorrow,” they could at least approximate the experience by buying “Super Shell,” the “motor-digestible” gasoline whose “daily use will save on your daily stop and go.” Here, then, was the perfect amalgamation of Resor’s interest in consumer engineering, McClintock’s insistence in traffic reduction as design consideration, and Bel Geddes’ fascination with commercialized versions of European and American modernism. Utopia was not far off in the future. In fact, it was very much in the present: beautiful, pristine, desirable, and most of all, fueled by gas. It all somehow rings familiar. During the early 20th century, art and architecture never existed wholly isolated from popular culture, consumerism, or corporate interests. This was the case in Europe as it was in the United States. As Le Corbusier’s Plan Voisin or the various Revere Copper and Brass ads that would appear in the United States in the 1940s demonstrate, corporate interests sometimes found an unlikely alliance with the avant-garde. 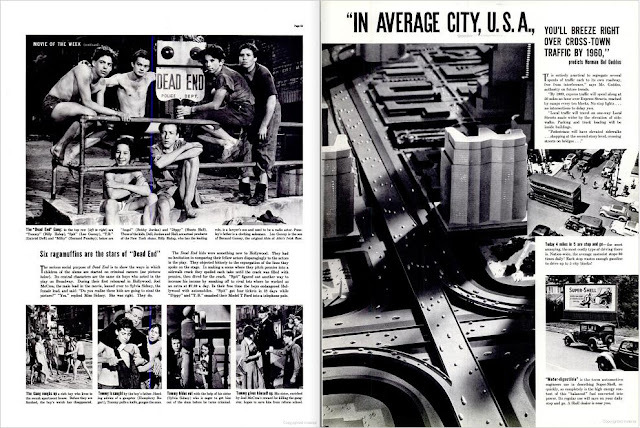 But with Bel Geddes and “The City of Tomorrow,” something slightly different was in order. The author of Horizons did see himself primarily as an artist, but never in the same vein as would Le Corbusier, Frank Lloyd Wright, or Erich Mendelsohn. As a person who always wore his commercial aspirations on his sleeve, Bel Geddes became a figure willing to leverage his artistic inclinations not only as a kind of expertise, but as a vehicle for transmitting ideas about contemporary urbanism to mass audiences. He was, in many ways, a person who popularized utopia by giving it its most tangible and visibly-appealing manifestation. This would be the case when, following on the footsteps of his successful Shell campaign, Bel Geddes was called to work for General Motors to design another “City of Tomorrow” for the "Futurama" exhibit at the 1939 New York World’s Fair. City of Tomorrow: Model 1939: (Top) Visitors gazing at Bel Geddes' "Futurama" model at the 1939 World's Fair in New York (Source: Morshed, "The Aesthetics of Ascension in Norman Bel Geddes's Futurama," 75); (Bottom) Cover to Magic Motorways (1940), Bel Geddes' book about the "Futurama" exhibit. The phrase changed from an appeal for business legitimacy to a home-front anticipation of postwar plenty, when manufacturers of building materials vied for control of the postwar building boom. Yet it also appeared in less commercial architectural and building literature, in “how-to” and do-it-yourself literature, and in the publicity of the building trades. More surprisingly, the phrase continued to resonate after the war, as urban planning organizations conscripted the phrase for their own publicity in a moment when the planning profession was reaching out for public relations techniques to communicate to the lay public. 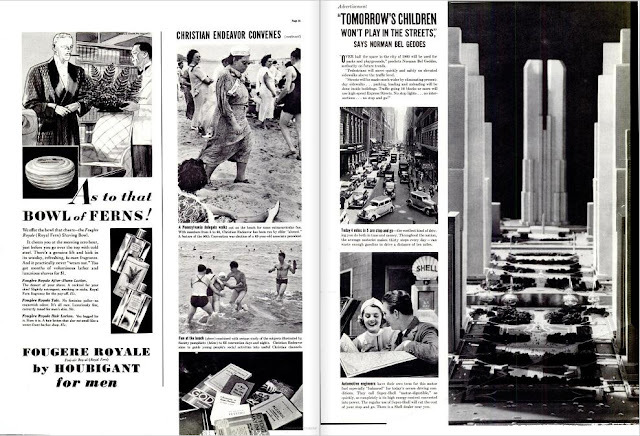 Perhaps, then, something of the same order happened with the idea of “good design.” The case of Bel Geddes’ “The City of Tomorrow” shows how good design became less of a functionalist idea and more of an ad copy technique. It was a strategy that relied on architectural modernism as a kind of visual commodity even before the heady, postwar output of firms like Skidmore, Owings & Merrill. And designers would eventually use similar techniques as part of their professional practice to "condition" clients much like Resor or Bel Geddes — and they continue to do so to this day. Chee Pearlman, “A Conversation About the Good, the Bad, and the Ugly” Wired 9.01 (Jan., 2001), available at http://www.wired.com/wired/archive/9.01/forum.html. Ibid. An unattributed version of this quote also appears in Virginia Postrel, The Substance of Style: How the Rise of Aesthetic Value Is Remaking Commerce, Culture, and Consciousness (New York: Harper Collins, 2004), 178. Paul T. Frankl, New Dimensions: the Decorative Arts of Today in Words and Pictures (New York: Brewer and Warren, 1928), 17. Raymond Loewy, Never Leave Well Enough Alone (New York: Simon & Schuster, 1951), 11, quoted in Carma R. Gorman, “Educating the Eye: Body, Mechanics and Streamlining in the United States, 1925-1950” American Quarterly, Vol. 58, No. 3 (2006), 839. Gorman, “Educating the Eye”, 840. Douglas Haskell, “A ‘Stylist’s’ Prospectus,” Creative Art 12 (Feb., 1933), 126, 132-33, quoted in Jeffrey L. Meikle, Twentieth Century Limited: Industrial Design in America, 1925-1939 (Philadelphia: Temple University Press, 1979), 148. John B. Watson, “Psychology As the Behaviorist Views It,” Psychological Review, Vol 20, No. 2 (Mar., 1913), 158. Quoted in Peggy J. Kreshel, “John B. Watson at J. Walter Thompson: The Legitimization of ‘Science’ in Advertising” Journal of Advertising, Vol. 19, No. 2 (1990), 50. Watson, “Psychology As the Behaviorist Views It,” 168. Kreshel, “John B. Watson at J. Walter Thompson: The Legitimization of ‘Science’ in Advertising,” 53. Resor is familiar to architecture audiences as one of Mies van der Rohe's first American contacts. Known better though a collage suggesting how its floor-to-ceiling windows looked out into the landscape, Mies' Resor House at Snake River Ranch in Jackson Hole, Wyoming remains one of his most enigmatic projects. For more about the location of Resor's house and Mies' involvement, see Michael Cassity "National Register of Historic Places Registration Form: Snake River Ranch" (27 October 2003) National Park Service (available at http://pdfhost.focus.nps.gov/docs/NRHP/Text/04001089.pdf). One account of Resor's first contacts with Mies can be found in Cammie McAtee, "Alien 5044325: Mies’s First Trip to America," in Phyllis Lambert, ed., Mies in America (Montreal, Canada: Canadian Centre for Architecture, 2001), 132-91, and "Alien 5044325: Mies’s First Trip to America" Harvard Design Magazine 14 (Summer, 2001), 69-75. Watson, Behaviorism (London: Kegan, Paul, Trench, Trubner, 1925), n.p. Meikle, “The City of Tomorrow: Model 1937,” Pentagram Papers 11 (London: Pentagram Design, 1984), 7-8. Many of the details concerning Bel Geddes’ “City of Tomorrow” for Shell Oil will come from this source, which remains the best interpretative account of this project. Ibid., p. 9. For more on Brooks Stevens, see Glenn Adamson, Industrial Strength Design: How Brooks Stevens Shaped Your World (Milwaukee, Wisconsin: Milwaukee Art Museum, 2003). 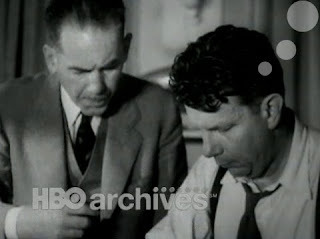 More about Stevens can be found at his company history website at http://www.brooksstevenshistory.com/. Norman Bel Geddes, Horizons (Boston: Little, Brown and Company, 1932), 287-288. 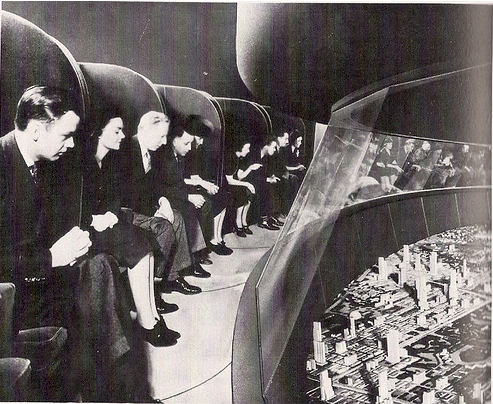 Meikle, “The City of Tomorrow: Model 1937,” 16. Miller McClintock, Street Traffic Control (New York: McGraw-Hill, 1925), 9. “Transport: Four Frictions,” Time (3 August 1936). Roland Marchand, “The Designers Go To The Fair II: Norman Bel Geddes, The General Motors ‘Futurama,’ and the Visit to the Factory Transformed,” Design Issues, Vol. 8, No. 2 (Spring, 1992), 27. 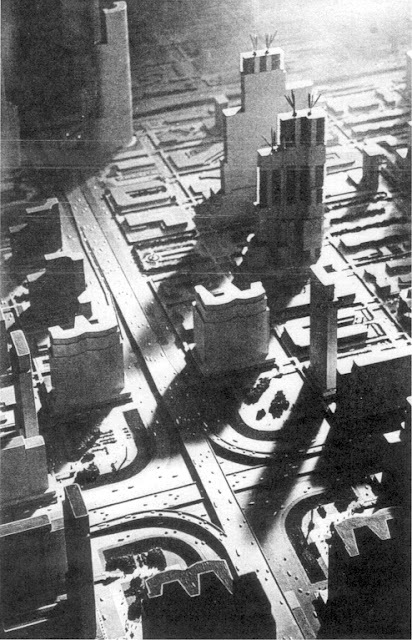 Meikle, “The City of Tomorrow: Model 1937,” 16-17. For more on this campaign, see Andrew M. Shanken, 194X: Architecture, Planning, and Consumer Culture on the American Home Front (Minneapolis: University of Minnesota Press, 2009). Roland Marchand, “Where Lie the Boundaries of the Corporation? Explorations in ‘Corporate Responsibility’ in the 1930s,” Business and Economic History 26 (Fall 1997): 81, quoted in Shanken, “Better Living: Toward a Cultural History of a Business Slogan,” Enterprise and Society, Vol. 7, No. 3 (Sep., 2006), 486. For more on the social history of American advertising and public relations companies during the early twentieth century, see Marchand’s Advertising the American Dream: Making Way for Modernity, 1920-1940 (Berkeley: University of California Press, 1986) and Creating the Corporate Soul: The Rise of Public Relations and Corporate Imagery in American Big Business (Berkeley: University of California Press, 2001). For an example of how this operated in postwar America, see Joan Ockman, “Art, Soul of the Corporation Patronage, Public Relations, and the Interrelations of Architecture and Art after World War II,” SOM Journal 5 (2008), available at http://www.som.com/content.cfm/art_soul_of_the_corporation. Shanken, “Better Living: Toward a Cultural History of a Business Slogan,” Enterprise and Society, Vol. 7, No. 3 (Sep., 2006), 485-519. A very interesting perspective on the definition, validity, and value of "good" design. Thank you for sharing with us. Well researched, it would be interesting to see all these thoughts compiled into a book. Its very well done.